The Iraqi government has every right to assert control over Kirkuk. The city had never been a Kurdish center and only after it repulsed threats by ISIS three years ago, did Peshmerga replace Iraqi government forces in the area. Peshmerga has been a coddled and abetted military presence in the US-UK-Israel plan to divide Iraq. (No Kurdish force has had any legitimate presence there.) So recent references by both National Public Radio and BBC news hosts about Peshmerga fighters representing Kurdish sovereignty in Kirkuk are misleading at best. 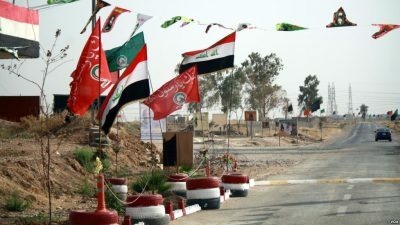 It is mystifying why the Turkmen of Iraq, a fiercely Iraqi nationalist, significant minority, has been so invisible in international press coverage of the region. This while they embody a remarkable ideal that opposes any military action. Visiting Kirkuk on two occasions before American forces invaded Iraq in 2003, I saw the displacement of Turkmen families (begun in 1991) in progress and I’ve followed their growing fear of Kurdish dominance, all without threat of armed retaliation. Their population is not small—at least three million– and many Turkmen are well placed in Iraq’s government. Although that proved insufficient to thwart Kurdish ambitions over Kirkuk. The wider public, it seems, is only permitted to know that Kirkuk sits on major oil deposits. (Of course that explains it being coveted by the Kurds in alliance with the West.) But what about the longtime Turkmen character and history of the city? What about the sustained opposition by Turkmen Iraqis and the Baghdad government to surreptitious tactics by the Kurds, to make it appear the city and surrounding areas is Kurdish and lies within the three Kurdish-dominated governates (Erbil—a once Turkmen-majority city for 700 years, Sulaimania and Duhok) that have enjoyed considerable autonomy since 1991. Kirkuk is no more a part of Kurdish Iraq than nearby Mosul is, and Kurdish rights to Kirkuk has never been part of the semi-autonomous understanding between Iraqi Kurds and Baghdad. Barbara Nimri Aziz is a New York based anthropologist and journalist. Find her work at www.RadioTahrir.org. She was a longtime producer at Pacifica-WBAI Radio in NY, also author of Swimming Up The Tigris, Real Life Encounters with Iraq, (University Press of Florida, 2007), based on her many years of work in Iraq.